The skin is the largest and also one of the most delicate organs of the human body. It is what others see and is an outward depiction of who we are. Most people who visit Rose Dermatology are looking for youthful, healthy, and vibrant looking skin and the ability to age beautifully and gracefully. For this custom dermatology website, we wanted to reflect the goals of this practice, as well appeal to the interests of those who might be searching for skin care in their local area. This website is based upon a traditional layout that includes an upper header menu and a home page introduction to the practice. We included a bright white full-width header image set against a darkened background for contrast. Home page image links divert attention to specific services offered at the practice, including hair removal, tattoo removal, skin rejuvenation, and Botox/fillers. Further into the website, visitors are given the opportunity to learn more about Dr. Rose, the types of services offered at this dermatology practice, and the various skin care products available for purchase. Gray and white are the primary color choices for this dermatology web design, primarily because they serve as a neutral basis for the pictures and information spotlighted on the website. Despite the name of the practice and the pictures of females throughout, gray and white allow for a more gender-neutral experience than other dermatology sites that may be geared primarily toward women. 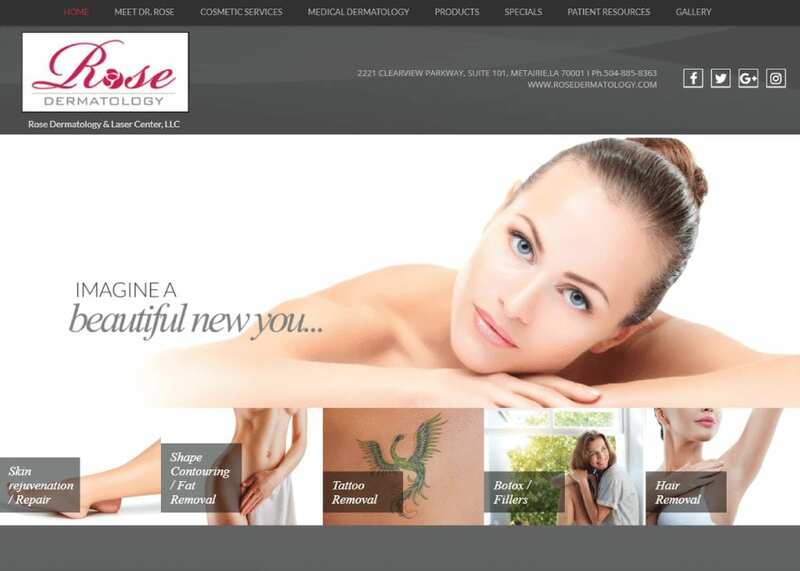 Rose Dermatology’s website contains a scrolling image header followed by a secondary image-based menu bar. This allows for customization and the ability to spotlight specific interests and services on the home page. We also included a video of Dr. Rose herself, which provides a more personalized introduction to her background, her mannerism, and her goals for medical and cosmetic dermatological treatment. As an added convenience, we included an extensive patients-only section that provides first-time patient paperwork, insurance information, and links to office hours and directions. While everyone should visit the dermatologist, not all people do. Marketing is an important part of operating a dermatology practice, and a custom website can be a powerful way of doing so. This website serves as a digital hub and office space complete with appointment request forms, promotional information, and testimonials from other patients. We also included links to the practice blog and social media accounts so that patients and future patients can stay connected with Rose Dermatology prior to and between visits. Finally, an image gallery yields insight into the types of results many patients achieve with treatment at this practice. This website depicts a soft image that is appropriate for both the medical and cosmetic sides of this dermatology practice. With a careful balance of imagery and text, new patients can expect care from an experienced specialist physician who is grounded in research, but also up-to-date on the latest in dermatological advancements and technology.